The night before Easter, the table was set with care, in hopes that our Easter Dinner would soon be here. The cats were all nestled asleep in their beds while visions of colored eggs danced in their heads. When, what to my wondering eyes should appear, but Jeff my husband, all donned in chef’s gear. He spoke not a word but went straight to his work. Now, Maple/Orange Glazed Ham! Now, Mashed Potato Casserole! Now, all the Easter fixes would appear. Then out on the lawn there arose such a clatter. I flew like a flash to see what’s the matter. I opened the door, no stranger indeed; it’s Miss Kim with a platter – a site to behold “Goat Cheese she said with Honey, figs & Pistachios”. The joy of our family and friends as we gathered – Happy Easter to all and enjoy a good bite! 1. On a small plate, spread out the chopped pistachios, Roll goat cheese on the pistachios to coat top and sides. Transfer to a serving tray. 3. In a microwave-safe dish, add the fig spread (similar to jelly), heat in microwave for 10 seconds. Drizzle over cheese log. Serve with crackers or bread. 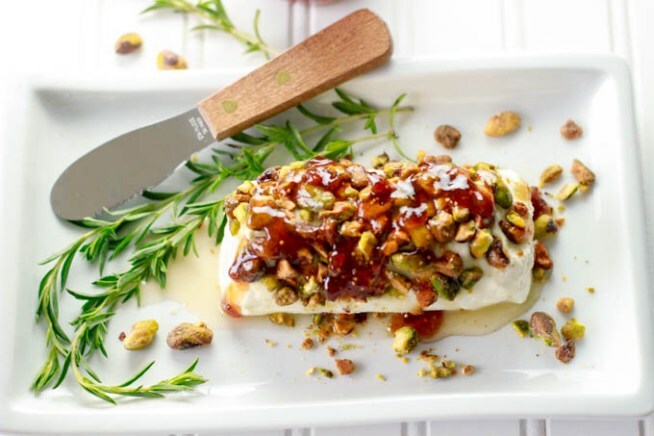 Rosemary flavored, or cranberry nutcrackers are especially tasty with the fig, honey and pistachio goat cheese.